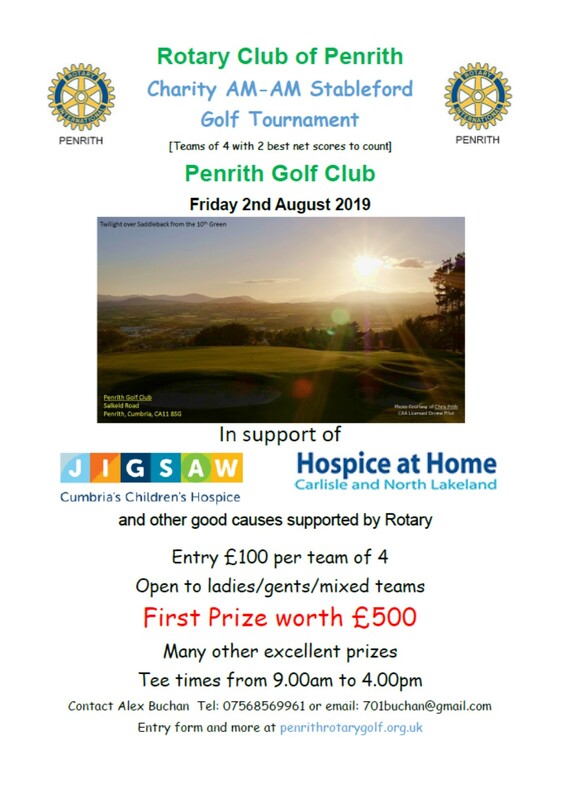 You are invited to take part in our annual golf competition to be held at Penrith Golf Club on Friday 2nd August. The tournament is an AM/AM stableford competition for teams of four with the two best scores counting on each hole. Handicap allowance will be 90% of full handicap up to a maximum of 24 strokes for men and 36 for ladies. Tee times are available between 8.00 am and 2.30 pm. The entry fee is £100 per team, which is considerably less than normal green fees for non-members – and includes entry to the Twos and putting competitions. Teams can be made up of all men, all ladies or mixed. Meals will be available, on payment, in the clubhouse throughout the day and complimentary refreshments will be provided on the course. We have a first prize worth £500 and many other excellent prizes. Furthermore, players will receive a voucher, entitling them to play a four ball at Penrith Golf Club at much reduced green fees. This year we are raising funds for the Jigsaw Children’s Hospice and Hospice At Home, as well as the other good causes supported by our Rotary Club. Jigsaw is Cumbria’s Children’s Hospice providing support to children and young adults with life limiting conditions as well as extending care and support to their families. Hospice at Home (Carlisle and North Lakeland) provides high quality care for adults with palliative and end of life care needs. Support is provided in patient’s home, residential care or anywhere the patient considers to be home.